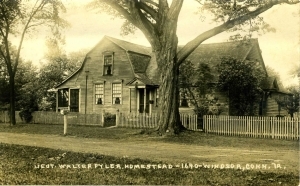 Description: Sepia toned photo postcard of the Walter Fyler House on historic Palisado Green in Windsor, CT. The house is now known as the John & Sarah Strong House and is operated as a historic house museum by the Windsor Historical Society. The house is located on the property originally owned by Lt. Walter Fyler, but more recent research has dated the house’s construction to about 1758.